One morning this March, Ryan Zinke donned a black cowboy hat, mounted a bay roan horse named Tonto, and paraded through the streets of Washington, D.C., to his first day at work. After settling into his wood-paneled office, the new Secretary of the Interior met with 19 hook-and-bullet groups, including Ducks Unlimited and the National Wildlife Federation (NWF). A portrait of Teddy Roosevelt was propped in front of his desk. The artwork was a well-placed nod to Zinke’s infatuation with America’s first conservationist president. During his confirmation hearing, the former congressman from Montana called himself an “unapologetic admirer of Roosevelt.” (Even the secretary’s Twitter bio contains a reference to #TeddyRoosevelt.) Zinke shares his idol’s environmental zeal to a modest, contemporary degree: He acknowledges climate change, supports the Land and Water Conservation Fund, and opposes the wholesale transfer of federal lands to states. But wildlife groups aren’t saying bully to Zinke just yet. On the same day he took office, the secretary shot down a ban on lead ammunition and fishing tackle on all U.S. Fish & Wildlife Service properties. He also announced that the Department of Homeland Security could waive protections for endangered species such as jaguars to clear the way for President Trump’s proposed border wall. And he hinted at reframing Greater Sage-Grouse management goals by “numbers, not habitat,” a discredited approach that could unravel a suite of collaborative plans developed by biologists, ranchers, energy companies, and state and federal officials. “We should be looking for ways to work with states to implement those plans,” says Sarah Greenberger, Audubon’s vice president of conservation policy— not torpedo them. Zinke’s actions are as concerning as his words. In late March, the secretary rescinded an Obama-era rule that directed the Interior to avoid projects that harm wildlife and habitat, and, if necessary, balance them with new restoration work. He also ordered a review of the department’s mitigation, climate change, and energy-development policies, a move that could put Arctic-drilling protections, climate-adaptation strategies, and an array of restoration plans on the chopping block this summer when recommendations are due. The disturbing news kept coming in April, when a leaked Bureau of Land Management (BLM) “priority work list” confirmed the agency’s aim to pivot from conservation to energy development. The memo calls for expediting the permitting process for drilling, coal mining, and pipeline construction; approving border security projects (read: the wall); and possibly defanging the Endangered Species Act. Additionally, President Trump ordered the secretary to investigate 27 national monument designations, a direct threat to the Antiquities Act, which was passed by none other than Roosevelt himself. But even if Zinke wants to help, he’ll be hamstrung by his agency’s budget. The Interior is already strapped for cash—the National Park Service alone faces a $12 billion maintenance backlog—yet President Trump has proposed to slash its funding by 11 percent, or about $1.4 billion. After his confirmation hearing, the secretary vowed to fight any cuts, adding, “I think I’m going to win.” The fact that he’s still losing, says Whit Fosburgh, president and CEO of the Theodore Roosevelt Conservation Partnership, suggests that Zinke may not be in Trump’s inner circle—which could make it harder to secure conservation dollars. Fosburgh, like most wildlife advocates, is withholding judgment on whether the fanboy can live up to his rhetoric. On the surface, Zinke shares plenty with his toothy idol, including a military background, a fondness for hunting, and a penchant for cantering through the capital on horseback. But for now, that’s where the comparison ends. “You want to be the next great conservationist?” asks Fosburgh. 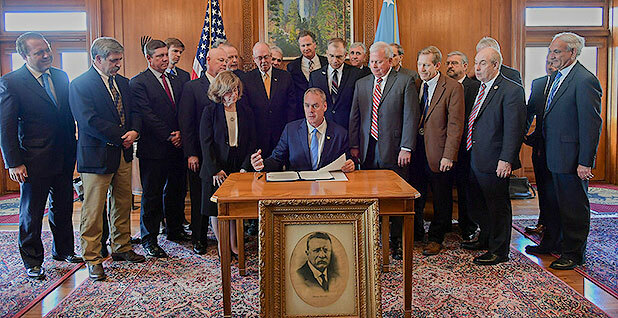 “OK, what positive steps are you going to take for the long-term management of our lands?” Unlike Roosevelt, Zinke has neither spoken softly, nor carried a big stick—at least, not on behalf of nature. Sweeping land-use plans kept the Greater Sage-Grouse off the endangered species list. What happens if the Trump administration rolls them back?